Showing 14 articles from June 3, 2013. Paul Van Dyck kicked off the summer season at the historic Fox Theater Centralia on Friday as the first performer with 2013's "Fridays at the Fox." Each Friday afternoon, the Fox will open it doors for free lunchtime entertainment and Van Dyck is quite the entertainer. The musician lives in Ryderwood and participates in the very active local arts community. One of his most recent projects is "Acoustic Saturday Nights" at the Ryderwood Café, which derive from previous musical gatherings at the venue. A number of local musicians get together and perform to an audience that may number three dozen or more, but more importantly, most are fellow musicians, the toughest kind of audience. Egg Days will once again be host to a carnival thanks to the efforts of local community organizers. The Egg Days Committee and Winlock Lioness Club report Butler Amusements will be setting up rides and events in the Winlock Miller Elementary School Athletic Field, located at 405 NW Benton Ave. Available rides will include; Cyclone, Slide, Zipper, Tilt-a-Whirl, Goofyville, Ghost Pirate Party, Scrambler, Hot Rods and Galaxy Swing. Quietly nestled in a spotless motor home in Toledo, the Swanson family invited me into their living room for an interview a couple weeks ago. Outside, dozens of flowers and a giant “Welcome Home” banner were visible through the rain. But nobody minded the weather. Back on May 8, just one month and six days after 16-year-old Forrest Swanson helped rescue a toddler from Wallace Pond while on an outing with his sister, he awoke to “a loud thump” around 5:15 a.m. while he and sister Sequoia Swanson were staying with relatives in Vernonia, Ore.
Solomon's Seal, or Smilacina racemosa, has made a few rare appearances in local forests during late May. There were beautiful samples on Winlock/Vader Rd. and a trio of plants along Nevil Rd., just east of Winlock. 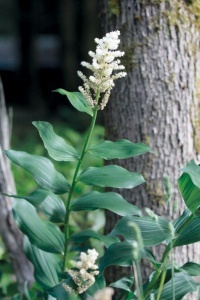 In reality, the Pacific Northwest version of the plant is False Soleman's Seal due to its resemblance of the true Solomon's seal, Polygonatum. Officials with the Timberland Regional Library District were on hand to answer questions during a meeting of the Vision:Toledo Business Association May 29. 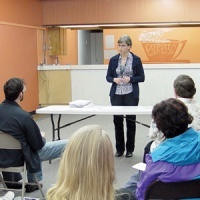 Held in the old Toledo pharmacy building, which owners Pat and Bill Caldwell have offered the community as a library, Timberland Director Cheryl Heywood said the first step toward establishing a local library service point was for voters to approve annexation into the library district this November. Currently, community members living outside the city limits are already part of the district and subject to a $0.415 per $1,000 property tax, but Heywood said these payments entitle those living within the district access to all resources and databases available through Timberland libraries, as well as their partners throughout the state. Vader is gearing up for a huge community fireworks display and organizers say they are putting the finishing touches on their Fourth of July plans. Sponsored by "one proud Air Force mom, three proud veterans and one Army brat," the event is planned to feature live entertainment, free food, events for kids and at least two hours worth of fireworks this Independence Day. The Winlock Historical Museum Cookbook, which has been in the works for a number of months, is finally finished and ready for sale. The recipes are from people who have lived in the Winlock area over the last hundred years. There are many pictures from the "old days," and family histories in the book. The price is $15, and they will make wonderful gifts and mementos. Cookbooks will be available at the museum on Egg Day, or by calling Sherri Kretz at (360) 785-3104. Happy June, everyone! I believe most of the snowbirds are home now and everyone’s yards and gardens are looking super. The rhodies are coming on strong, some of the earliest ones fading already. This is my final reminder for the 5th Annual Ryderwood Blues Extravaganza coming up this Saturday June 2 p.m. It will be in the Community Hall Auditorium and there is no charge. (All proceeds in the "tip jar" will be donated for traveling expenses.) They’re practicing big time and I expect a surprise or two. Diana Haug extends her thanks publicly to those who tidied up the Toledo Senior Center on Clean-Up Day Saturday. Vision:Toledo Arts, Recreation and Entertainment reports the School Garden Initiative projects "humming along," with Chuck Reynolds, John Ball and great students doing great tomato and pepper sales at the high school. "June 6 & 7, Toledo Elementary will plant seed potatoes and learn about powers of observation," says Deidre Dillon. Other reports: downtown planter boxes now boast nine sculptures from Ron & Victoria Smith, and Cheese Days, the Steelhead Derby and Riverfest are fast-approaching. Congrats to Winlock High School’s graduating class! I can’t believe that another year has passed, and another batch of you guys and gals are being sent off into the world. Sniff. You seem so young. Anyway, the graduation ceremony is all set for Saturday at 2 p.m. in the Winlock Middle School gym. APOLO graduations are scheduled to follow at 6 p.m. The Olequa Senior Center is currently forming a new Advisory Board and is accepting nominations. If interested in a Board position, please call the center at (360) 785-4325 or contact them in-person by Friday, June 7. An election for the Advisory Board is scheduled for 10 a.m. that day. Even if you don’t want to be on the Board, please plan to attend and cast your votes! A proposal to extend the hours of the Castle Rock Library was approved during the May 28 Castle Rock City Council meeting. Presented by Librarian Vicki Selander and supported by members of the Friends of the Castle Rock Library, the proposal asked for library hours to be extended from 20 to 25 hours per week and for an extra employee at 15 hours per month. Selander said an assistant would allow her extra help at the library as well as the possibility of taking sick days if needed. Castle Rock Senior Austin Moore and Winlock Junior Chance Fisher placed in their respective events at the WIAA State Track and Field meet on the campus of Eastern Washington University Saturday in Cheney. Moore placed 2nd in the 400 meters with a time of 50.24 which was a season best time. Moore also placed 5th in the 200 meters in a personal best 23.01. Fisher was in a four-way tie for 3rd place by clearing 6'0" in the high jump. 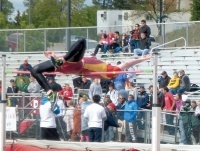 He had failed to jump six feet or higher since the first meet of the season on March 21st when he elevated to 6'1". Fisher said he was happy to have a shot to go to state. Hell Day. The Fry-n-Cry. A study in less-lethal force. Whatever you call it, Saturday brought the toughest challenge yet of the 2013 Police Reserve Academy in Winlock as cadets learned first-hand the effects of tasers and pepper spray. Though June 1 had been marked on their calendars since the academy began in February, there was little cadets could have done to brace themselves against several thousand volts of electricity and a 10% concentration of oleoresin capsicum, except hop in line and have faith in their instructors. 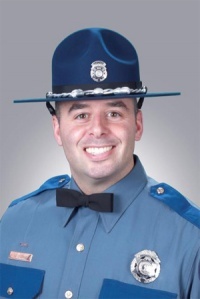 (Olympia)—Washington State Patrol Chief John R. Batiste announced this evening the death of WSP Trooper Sean M. O’Connell, 38, assigned to the Patrol’s Marysville district headquarters. Trooper O’Connell was killed in a collision between his motorcycle and a box-truck on Fir Island Road in Skagit County shortly after 5 p.m. Friday. Trooper O’Connell had been with the agency for 16 years, was married with a son, age seven, and a daughter, age five.